Use a sharp chef's knife to slice the yams into slices about 1/16-inch thick (leave the skin on). Heat 1 cup of olive oil and 1 cup of canola or vegetable together in a large, heavy-bottomed pot, over medium heat, just until it begins to bubble. Working in batches, cook the sweet potatoes in the hot oil until the edges are brown and the slices begin to crinkle. Drain on paper towels and sprinkle generously with the smoked sea salt. Serve warm, or cool to room temperature. Store the chips in an airtight container for up to 4 days. Did you know March 23rd is National Chip & Dip day? 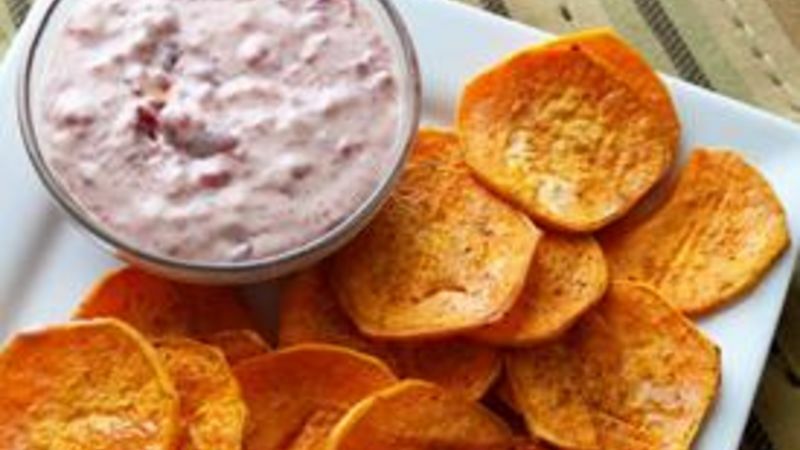 Celebrate in style with this unique Olive Oil Sweet Potato Chips with Smoked Sea Salt recipe. Just as sweet potato fries have elevated traditional French fries, these chips are a nice change from the usual plain potato. These are crackers for your crab dip and a vehicle for your vegetable dip. They’re a sidecar for your sandwich and a buddy for your burger (alliteration much?!). Use a sharp chef's knife to slice the yams into slices about 1/16" thick (leave the skin on). Heat 1 cup of olive oil and 1 cup of canola or vegetable together in a large, heavy-bottomed pot, over medium heat, just until it begins to bubble. Working in batches, cook the sweet potatoes in the hot oil until the edges are brown and the slices begin to crinkle. Drain on paper towels and sprinkle generously with the smoked sea salt. Serve warm, or cool to room temperature. Store the chips in an airtight container for up to 4 days. Feel free to serve these as a side dish, but also consider using them as an alternative to crackers or chips when entertaining. Serve them with salsa, creamy spinach dip or even make sweet potato canapes with a dollop of guacamole and a bite-size piece of carne asada. Also, make sure to let these sit for at least 10 minutes after frying and before eating. As they cool, they will become sturdier and crisper, making them all the better for transporting other goodies to your mouth.